Did you know that by substituting olive oil for butter even if you’re overweight, can help lessen your chances of getting diabetes, heart disease, and other conditions associated with flab around the middle? Then you can imagine how delighted I was for the opportunity to work with award winning California Olive Ranch and their Select Extra Virgin Olive Oils for this review and giveaway! 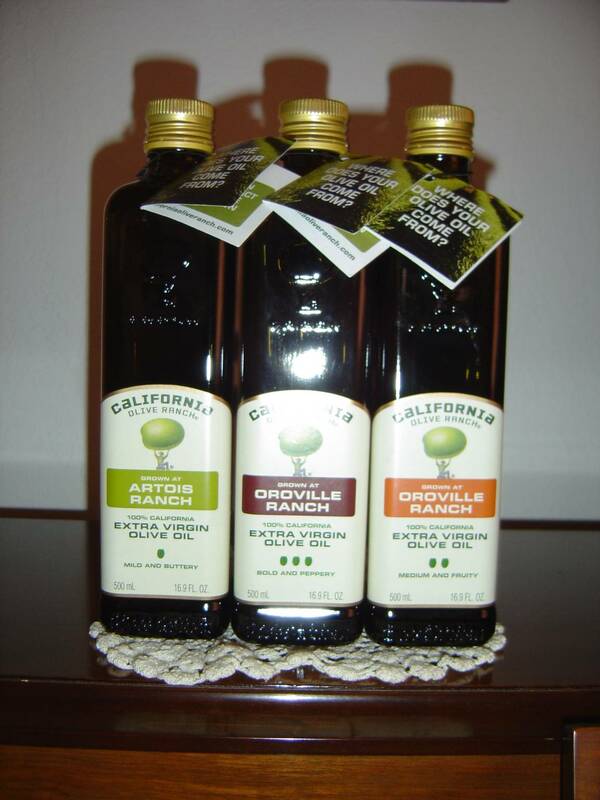 I received all three of their Select Extra Virgin Olive Oils to experiment with and share my findings with you: Artois Ranch (Mild and Buttery), Oroville Ranch (Bold and Peppery), and Oroville Ranch (Medium and Fruity). The bottles themselves were just the right size of 500 ml for storage in small kitchens or without worry of being a giant size to go rancid. The spout itself was ideal being made that it was spill-proof so that not one precious drop ever gets wasted, which any consumer would appreciate. These oils were superb for unique flavor characteristic of that region and added something special to each of my recipes that I made. However, such rich flavors to compliment those recipes are not surprising considering this company won 38 awards in seven years with 15 gold medals. The first recipe I made called Spicy Squash Pasta is a no fuss summer dinner that is quick, healthy, and so delicious with California Olive Ranch Select (Mild and Buttery), especially served with my homemade pasta recipe. If you do not care for a spicy, hot flavor, then rest assured you can alter this recipe with bell peppers. The second dish I want to share with you is an old recipe that my great-grandmother used to make with sauerkraut, noodles, and cottage cheese. However, I substituted elbow macaroni and caraway seeds, which add an interesting flavor reminiscent of rye bread to compliment the other ingredients in this easy recipe I call Bubba’s Special Cheese and Noodles. Again, if you hate sauerkraut, this dish also tastes wonderful plain. To make a meal complete, I love fresh salad with homemade dressing as I shared with you in an earlier post. Let me tell you that adding the California Olive Ranch Select Medium and Fruity to My Favorite French Dressing intensified the natural flavors of the greens and spices beautifully. This product was also excellent to use on my Low-Cal Oven French Fries. My oven fries are perfect for satisfying that craving for French Fries with only three tablespoons of California Olive Ranch Select Mild and Buttery. These fries are the only ones I eat without guilt! Microwave your peeled, chopped butternut squash on high for a few minutes until done (time depends on your oven) to speed the cooking process along. Next brown your chopped onion in the olive oil along with the chopped peppers, cooked squash, sugar, and salt. This vegetable sauce is good to coat one pound of pasta or my pasta recipe using three of flour. Drain your sauerkraut and rinse before boiling first. Cook and then drain your sauerkraut before adding to chopped onion in the olive oil until done. Add the Caraway seed, sugar, and salt and mix together before adding your one pound of cooked elbow macaroni add one pound of creamy cottage cheese last to serve. Mix everything together except the vinegars and oil. Pour the vinegars on the olive oil slowly and then stir everything together and pour into a closed bottle container. Refrigerate for several hours to let the flavors mingle before using. This makes one pint. Peel your potatoes, cut both ends, and then cut in strips like French Fries. Get a 3-quart mixing bowl and add those sliced potatoes and coat with the olive oil. Spread those coated potatoes on a cookie sheet , sprinkle with some salt, and bake at 400 degrees for about 30 minutes turning during the first 15 minutes. These will get golden-brown and are a great substitute for French Fries. Seriously, I’ve tried a lot of different olive oils. Most I haven’t noticed that much of a difference that is until I discovered California Olive Ranch Select Extra Virgin Olive Oils, which really add a special something to whatever you make. You can find store locations or buy online. Now the company is offering a special 10% discount online when you enter the word BLOGFRIENDS as your coupon code. Follow California Olive Ranch on Twitter @rusthawk. I am subscribed to your RSS feed in my reader. I'm a GFC follower. I liked COR on fb. I follow @Nuts4Stuff to Your Twitter as willitara.